Hammerax has released the Feather brand cymbal line, described as "precise, fast and dark" 18" cymbals. Not a crash, not a ride, OMNI is a new cymbal from Cymbal-maker Sabian. 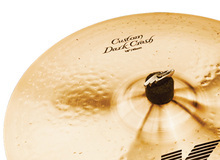 Swiss cymbal maker Paiste announces the introduction of the Alpha Swiss Crashes. Hammerax has released a line of loud, brilliant bell cymbals, designed for mounting independently, or "upside down" above cymbals. The bells are available in 6", 7", 8", and 9.5". The artisans of the Sabian Vault are marking 20 years of this cymbal with the design of a new B8 Pro. Hammerax announced expansion of its Whipcrash brand to 4 loud crash sizes – 18", 21", 24", and 24" Ultra. Whipcrash features an S-Shaped array of Microcups, which can be raked for one-handed rolls. New Grilles from TRX Cymbals feature a "distinctive design and venting system that give them a unique sound that's more than a crash but less than a china." 04/18/09 in Sabian Artisan Crash 16"
Sabian has added a crash model to their Vault Artisan range of professional cymbals, the Artisan Crash, a thin/extra-thin model in 16- and 18-inch sizes. Sabian has introduced the AAX X-Plosion Fast Crash, which it describes as "thinner, more responsive and with a glassier, higher pitch".